Raptors or birds of prey capture live prey, have large talons (nails), and a hooked beak. When looking at our Raptor Free Flight species, one of our birds doesn't quite fit all of the criteria to be a true raptor. The Chihuahuan Raven is well known for being exceptionally intelligent birds; they are also incredibly playful. Ravens have been documented stealing windshield wipers off parked cars to goof around with them. There are even videos on the internet of ravens using toys such as jar lids for sleds, etc. The Great Horned Owl is also a nocturnal hunter that uses its hearing and sight to locate prey. When hunting, they perch and wait for prey to scurry under them, then pounce down to capture it with their strong talons. The Prairie Falcon is known for possessing rather irascible personalities. Despite their small size, they have been documented driving away owls and eagles from their nesting locations, sometimes resulting in the death of the eagle or owl. The Ferruginous Hawk is a true raptor that makes the Sonoran Desert home, but only during the winter months. Their wide gape, or mouth, makes it easier for them to eat their favorite prey item, prairie dogs. The Red-tailed Hawk is one of the most commonly seen raptors in North America; also the most commonly heard raptor as well. In every commercial, tv show, or movie, the scream used as a sound effect is the scream of a redtail hawk- regardless of the bird being shown on the screen. The Gray Hawk almost disappeared from our desert landscape; 15 years ago there were only about 80 known nesting pairs in Southern Arizona. Through riparian conservation efforts, and practicing wise use of the land those numbers have increased to nearly 200 nesting pairs. Also, the Desert Museum is the only AZA-accredited facility to display a Gray Hawk. The Common Barn Owl is so named due to its almost worldwide range, on every continent except Antarctica. 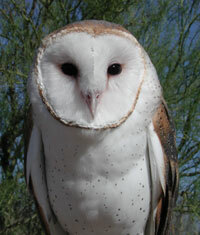 Barn Owls are nocturnal and fly silently through the night using their acute sense of hearing to locate prey. The Peregrine Falcon is generally considered the "fastest animals on the planet"; they are certainly the best documented. A skydiver jumped out of an airplane with a trained peregrine, and clocked the bird at 243 mph in a dive. Unlike other raptors, Harris's Hawks hunt and live in family groups. Family groups range in size from 3 to 7 hawks. Family groups work together to protect their territory and care for their young.